To everything there is a season, and, so too, it goes in the story of the boys from New Jersey who would become the most popular rock & roll act prior to the advent of "The Beatles": “The Four Seasons.” As the show’s name implies, their story is as rooted in the rough and tumble culture of the Garden State as it is in their unmistakable musical talent. In fact, there is a warning at the door that the special effects include “authentic” NJ language! The four leads each take a turn recounting the stages of the group’s history. 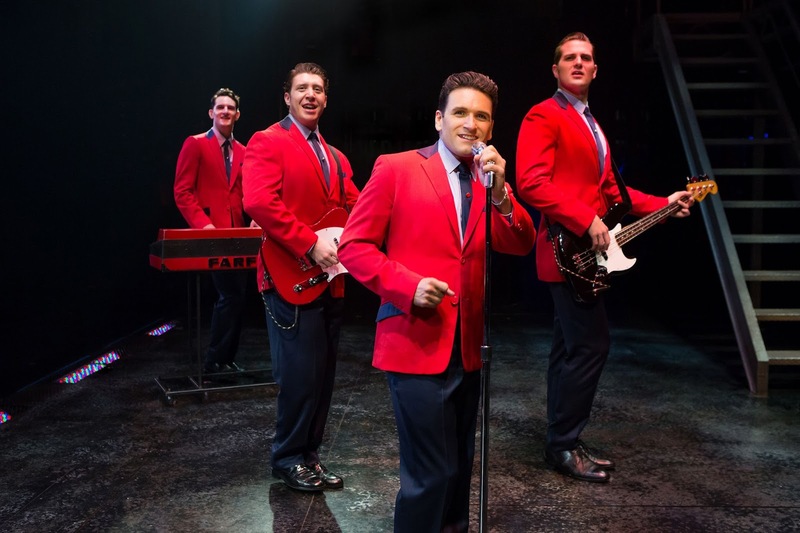 Tommy DeVito, played with volatile humor and swagger by Matthew Dailey starts things in motion more by trying to make an easy buck than an artistic statement. Dailey lets the audience know that under the machismo is a clearly a guy who is often over his head. DeVito’s polar-opposite, partner-in-crime is Keith Hines’ Nick Massi, with his stoic demeanor and deadpan, audience-tickling delivery. Cory Jeacoma’s earnest and levelheaded composer Bob Gaudio provides a lightness needed to offset some of the darker elements of their journey from rags to riches. Despite equal emphasis on each member’s contributions to the group, the success of the quartet is only going to be as strong as the voice of the show’s Frankie Vallie. Aaron DeJesus literally hits all the right notes as the singer who would make The Four Seasons stand out from the crowd, and eventually eclipse the group itself. It is rare that a mid-show solo elicits a standing ovation. But make no mistake; each is a talented actor, singer, dancer, and musician, making the non-stop pace and momentum of the show seem effortless. If the against all odds story, rock and roll setting and snappy choreography weren’t enough, there is of course the eminently tuneful music. Even those under the age of 50 will recognize the songs from movies, TV shows, and commercials. Classics like “Walk Like A Man,” “December, 1963,” “My Eyes Adored You,” and “Who Loves You”, just to name a few. If there is any question from regular theatre-goers as to whether this group really warrants musical-theatre treatment, one only has to look around at the audience, evidently made up of a good number of patrons more accustomed to concert venues than proscenium shows and visibly fighting the urge to dance in the aisles.